Sometimes we allow Madison to play with her food, but not before we get our hands on her plate first. If you follow me on Instagram you may have seen a few images of what our little one has been eating from time to time... let me explain. One of the goals most important to Allison and me is that we always have dinner as a family. I grew up in a house where everyone was present and sitting in their designated seats at the table when the last meal of the day was served. We blessed the food and shared the highlights (and low-lights, if applicable) of our day as a family in effort to take a break from the hustle and bustle of life, to reconnect with each other, to refocus and reprioritize... together. Allison and I agreed before Madison was born that this would be something we implemented in our own home. Every night we make an effort to sit down, all three of us, at our kitchen table and enjoy each other’s company over warm dishes. More often than not, the television is turned off and instead the house is filled with conversation and delicious aromas rising from our plates. We’re a one meal house in that Madison eats the same thing her mother and I do for dinner as we try not to invite the habit of preparing something for ourselves and then another meal entirely for her, if we can help it. That being said, breakfast and lunch are a completely different story. For the first and second meals of the day, Madison can have whatever she wants (within reason… no cookies for breakfast). Because of the one meal rule we silently reserve for dinner, Madison usually eats vegetables she doesn’t consider to be fun or aren’t quite as colorful as she would like. Purple is her favorite color, not green with the exception of asparagus or Lima beans (we call them butterbeans) -- she loves those -- so occasionally we’ll perk up her plate a little bit for breakfast and/or lunch. 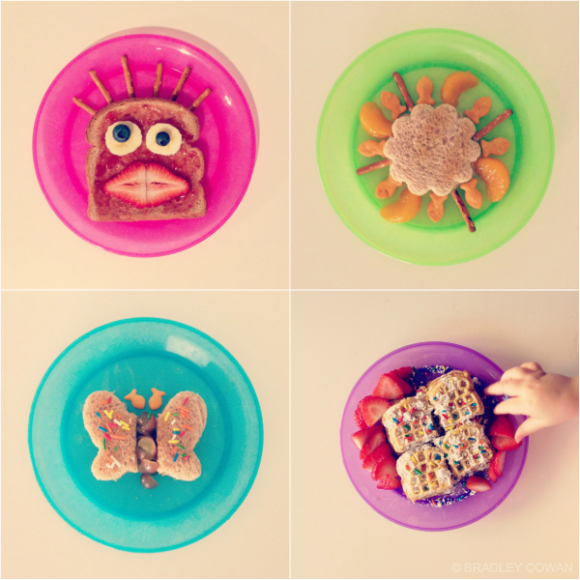 Her favorite so far has been the Monster Toast (the pink plate). I always serve a side of additional bananas, blueberries, strawberries, etc. so she has a full serving which usually means she eats a little and redecorates the face a little and then eats a little more. Most importantly, she’s eating and it’s proven to be a reliable yet easy method to ensure she gets fruit in her diet. I wish I were as creative as you! I love that you sit down as family for dinner. We do the same! And what?! No cookies for breakfast. I have DEFINITELY broken that rule.